Members of the genus Rhodococcus have metabolic versatility and unique adaptation capacities to fluctuating environmental conditions, enabling the colonization of a wide variety of environments; they also play an important role in nutrient cycling and have potential applications in bioremediation, biotransformations and biocatalysis. 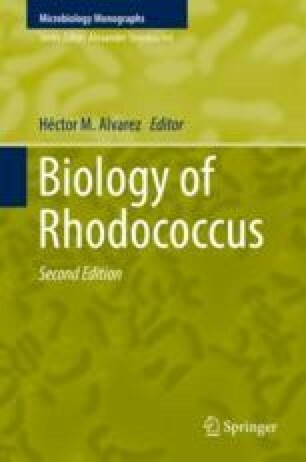 Rhodococcus spp. are mainly distributed in soil, water and marine sediments, although some of them are also pathogens for humans, animals and plants. Consistent with the wide catabolic diversity, Rhodococcus spp. possess large and complex genomes (up to 10.1 Mbp), which contain a multiplicity of catabolic genes, high genetic redundancy of biosynthetic pathways and large catabolic plasmids, the latter encoding peculiar metabolic and physiological traits. Recently, the progress in sequencing technology led to a dramatic increase in the number of sequenced Rhodococcus genomes, which have been investigated through diverse bioinformatic approaches. In particular, whole-genome comparative and genome-based functional studies were associated to omic technologies for the study of the global Rhodococcus cell response with the aim of providing insight into the genetic basis of specific catabolic capacities and phenotypic traits. Lastly, genome-based advances in Rhodococcus engineering led to the first design of molecular toolkits for tunable and targeted genome editing. Besides this, genome-based metabolic models were developed to make metabolic predictions of the Rhodococcus cell response to specific growth conditions. Both the synthetic and system approaches offered new opportunities for genome-scale rational design of Rhodococcus cell for environmental and industrial applications.